Want to learn how to make the best beef jerky at home? 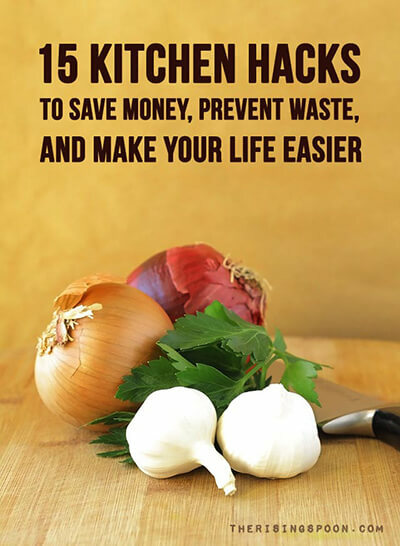 It's much easier than you think! 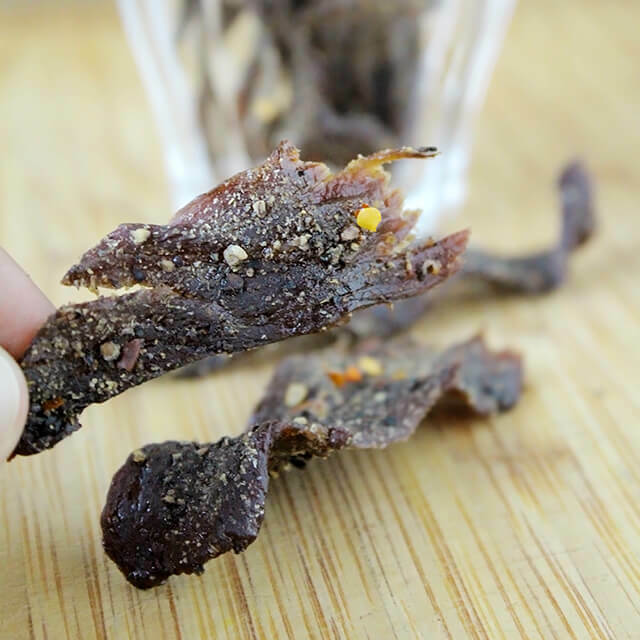 I'm sharing my favorite recipe for spicy black pepper beef jerky + how to make jerky in the oven. 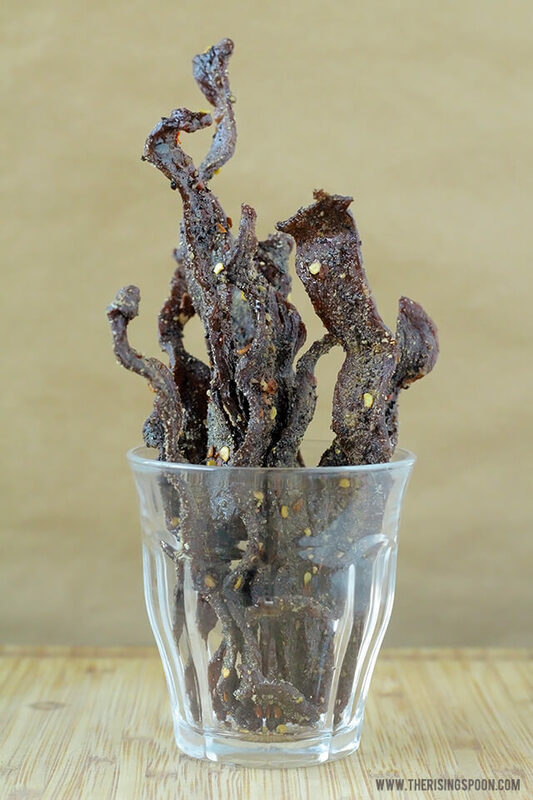 Once you try homemade beef jerky you'll never go back to the store-bought stuff! Foodie Friends: I've been holding out on you. Unintentionally, of course! Three years ago I came up with the best recipe for homemade beef jerky using my oven. 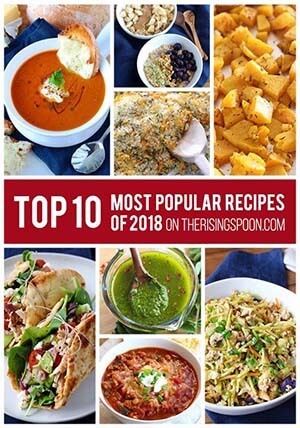 I've posted about it several times on social media when giving it for holiday gifts or fixing a batch for my boyfriend, promising to share the recipe soon, but it just never happened. I'm finally sharing it now. Sorry, it took so long! Back when I originally devised this recipe, I was tired of the overpriced, overly sweet commercial beef jerky marinated in sugar, high fructose corn syrup, teriyaki sauce, and soy sauce. I yearned for something savory, spicy, and slightly salty to snack on, but couldn't find it anywhere. Literally, every package of black pepper or spicy beef jerky I looked at still had sweet stuff or weird additives mixed in. So, I took to the interwebz to see if I could 1) make it at home and 2) without a dehydrator. I stumbled upon an oven-dried beef jerky tutorial from The Art of Manliness. Looked easy enough, but their beef jerky recipe called for a marinade that included all the ingredients I wanted to avoid: soy sauce, teriyaki sauce, corn syrup, and sugar. After mulling it over, I decided to borrow their technique for drying the jerky and skip the marinade in place of my own favorite blend of savory and spicy seasonings. What was the result of this little experiment? The most bangarang (i.e. excellent, rad or awesome) beef jerky I'd tasted in years. What made it even better was "testing" the jerky for doneness while it was still warm from the oven. Oh, lawd. It is so good. The beef flavor really shines while it's still warm and chewy, which is accented by the savory onion and garlic and spicy black pepper and crushed red pepper. Seriously...the hardest part of making homemade jerky is resisting the urge to eat half the batch straight out of the oven. This is the third year in a row we're giving out this jerky as a holiday gift along with other goodies. And because beef jerky is so addicting fresh out of the oven, we planned ahead and made a larger batch earlier this week using 4 pounds of beef to ensure we could still snack and have plenty left over for others. Ready for the technique and recipe? Hold your horses! First, I want to share a few tips for easy and successful jerky making at home. 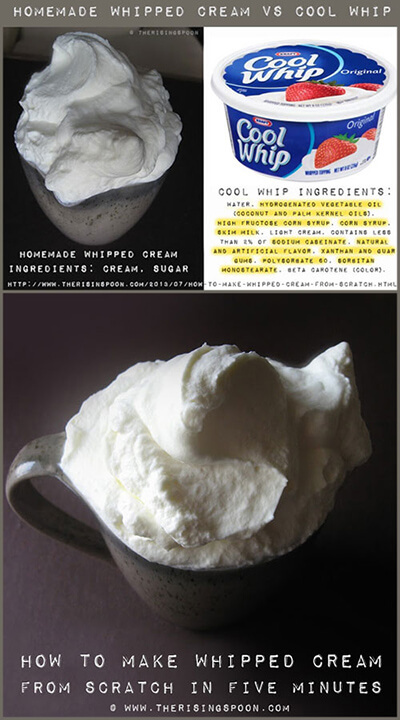 Just in case you're the type to skim through the recipe and forget the read the additional notes. 1. Look for the leanest cut of meat you can find. Layers of fat on the outside of a cut are easy to remove, but you don't want a piece of beef that has a lot of marbling throughout it. Why? Jerky needs be dry and fat keeps it moist + goes rancid quicker. 2. If you're buying your meat fresh from a butcher, save yourself some time and have them slice it for you. 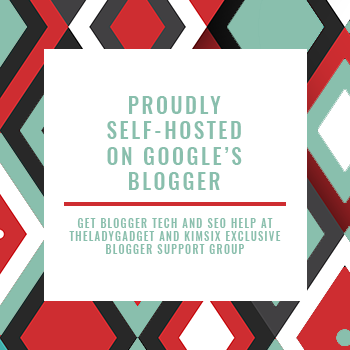 Trust me, you will thank me! This saves a bit of time + ensures that all the slices are of even thickness. Is this required? Heck no, I've sliced many a batch by hand at home, but I sure love when the butcher does part of the work for me. 3. Slicing the jerky yourself? Stick the meat in the freezer for 30-60 minutes first. This will make the meat waaaaaay easier to slice. Also, using a sharp knife helps. And if the meat starts to soften up on you while you're slicing (this typically happens to me in the summertime), just stick it back in the freezer for another 20 minutes, then start again. 4. Clear plenty of counter space for seasoning the jerky. I have what I consider a fairly small apartment kitchen, so I have to do a bit of rearranging first, but it's worth it. I don't want raw meat touching any of my other stuff. I also lay out big strips of wax paper or parchment paper on the counters so I can season each piece of meat all in one go. 6. Don't leave your home unattended while the jerky is drying in the oven. This tip is more of a safety recommendation, but I think it's worth mentioning. In order to get maximum circulation and drying capabilities from your oven, you'll use a utensil to prop open the door. 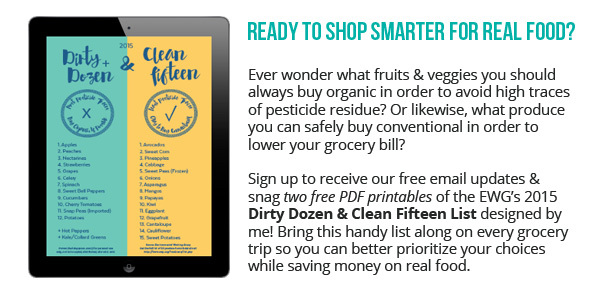 If you're banging around the kitchen or near the oven, a pet brushes up against the stove door, or an upstairs or downstairs neighbor (apartment situation) stomps around and/or drops something heavy, the utensil can slip and fall into the oven. If your utensil is wooden or plastic...that's a recipe for a fire. Or, if one of your beef pieces isn't supported well on the oven racks and slips off in the first 30 minutes in the oven and falls onto the heat coils below...that's also bad. Better safe than sorry. I suppose this is one of the major benefits of owning a dehydrator. Jerky typically takes 5-6 hours once it's in the oven to dry (time may vary depending on thickness), so plan on making it on a day when you can stay home. 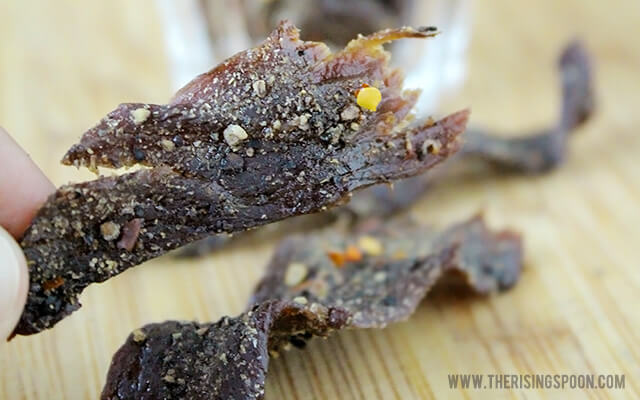 If you love savory and spicy beef jerky with tons of flavor, you will fall head over heels for this recipe! Learn how to make the best beef jerky in the oven that beats the socks off the stuff you'll find in stores! 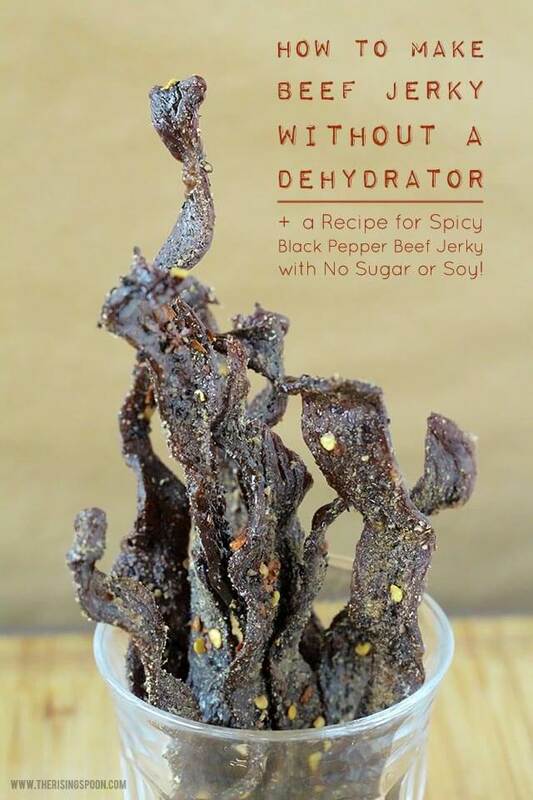 I also share my homemade recipe for spicy black pepper beef jerky with no sugar or soy! Stick your meat in the freezer for 30-60 minutes to firm up so it's easier to slice. 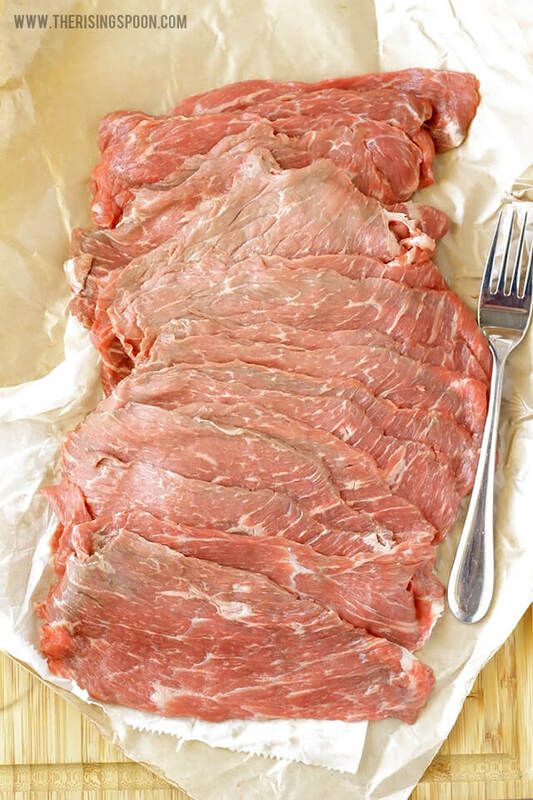 Trim off any visible fat, then slice the beef into thin, even pieces (usually around 1/8 inch thick), then into strips (if you're using a big cut like a top or bottom roast) 1/2 to 1 inch wide. You can cut against the grain or with the grain. Totally up to you. The only thing it will affect is how the jerky tears when you bite into it. 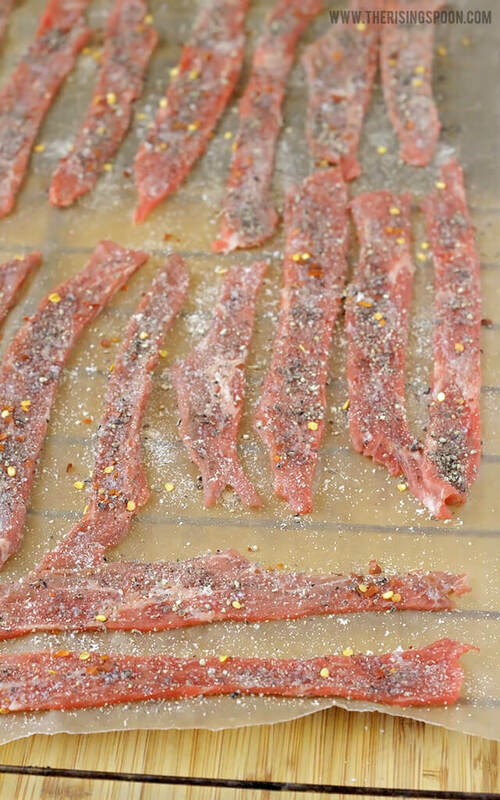 Lay the beef strips out on wax paper, parchment paper, or cookie sheets (whatever you prefer - just make sure it's a sanitary surface that's easy to clean up) and season both sides with the sea salt, garlic, onion, black pepper, and crushed red pepper (or whatever seasonings you prefer). If you want to save time, mix all the spices together first; however, I prefer each piece to have a decent amount of each spice on it, so I season them individually. From here, pull out your two oven racks and lay the jerky pieces across the wire racks (it's okay if they drape down) leaving a bit of space between each piece of meat. 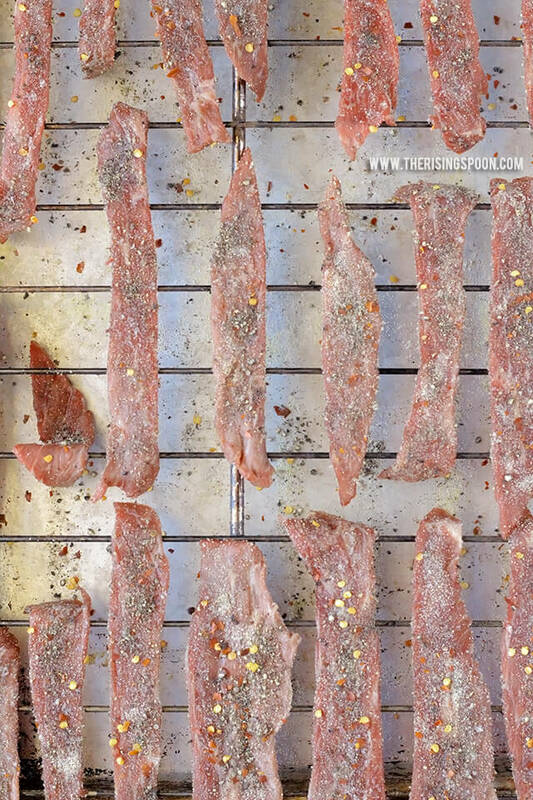 Make sure each piece of jerky is secure on the rack so it won't fall to the bottom of the oven. Carefully slide the racks back into the oven leaving a bit of space in between each rack and making sure no beef jerky is touching the top or bottom of the oven. Turn the oven on to the lowest setting it will go (mine is 170 degrees, but if yours goes to 160 or 150 that's great, too) and stick a wooden or metal utensil in the oven door to keep it cracked and promote air circulation. Depending on the thickness of your jerky pieces, they should take 5-6 hours to fully dry out. Some tiny pieces (if you have any) could be ready in as soon as 4, so you may want to peek into the oven to check on their progress. When the jerky is ready, it will tear easily, but not snap in half immediately with pressure. Don't worry if you leave 'em in there a bit too long and they're all snappy. They still taste delicious! Once the jerky's out of the oven, lay all the pieces on a paper towel, newspaper, or a clean cloth towel to absorb a bit of the grease and then let them continue to try for a few hours or overnight, then place in a sealed container for long term storage. Technically, these should last a few months (as long as the fat doesn't go rancid), but my batches are always eaten within 1-2 weeks. If you feel weird about leaving them out at room temperature, you can always keep them in the fridge. Either way will work! The yield will vary based on how thick or thin you (or the butcher) slices the beef. I got 55 wide & thin pieces of jerky from this batch. You may need more spices than this. It will all depend on how precise you are when you're sprinkling it over the beef and how much meat you're using. If you have a lot of spill-off then you'll need more. You might also want more or less of a particular spice. There's a lot of room for flexibility here! What are your favorite seasonings for jerky? 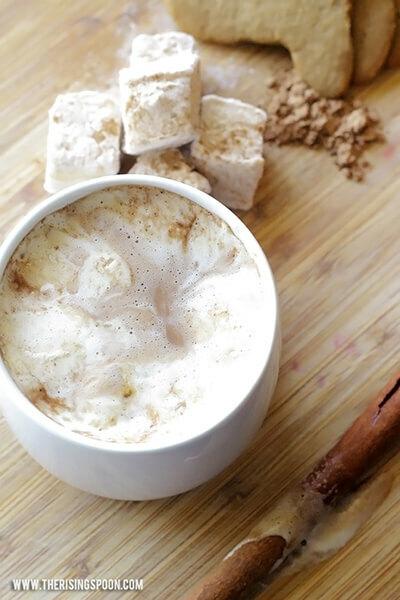 Do you have any tips or tricks for making it at home?